Where is the dashboard camera mounted? 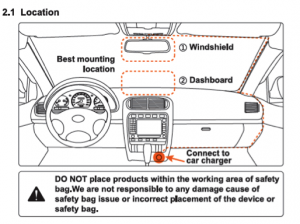 The dashcam is typically mounted onto the vehicle’s front windshield or dash board with optional purchase of dashbag. You should not set/ install this dashcam at a place that would obstruct or reduce a driver’s view. Make sure your usage complies with the pertinent vehicle codes of your state, province, territory or country. How is the dashboard camera powered? Using the supplied DC power adapter, all PAPAGO! dashcams are powered through the vehicle’s cigarette lighter socket. However, the design of the power supply from a cigarette charger varies by each model from car manufacturer We recommend to test or check the user manual of your car for more details. Will there be any wires hanging from my dashboard camera? All PAPAGO! dashcams comes with a 4 meters (13.25 FT) long DC power adaptor cable, which can be routed and hidden between the gaps in various places such as the vehicle’s headliner and the pillar. What is the recording time of the dashboard camera? The data will be saved into an SD or Micro SD memory card. Can you record at different resolutions? You can adjust the resolution setting within the dashcam’s settings menus. Does the GPS on the dashboard camera help me navigate when driving? No, the GPS logging is similar to the time and date stamp on your dashcam and will display on your footage playback. How can I view my recorded videos? Dashboard Camera’s Screen – Directly playback on the dashboard camera by entering the playback mode using the “MODE” button. Computer – Unplug your SD or Mini SD card from dashcam and plug into your computer. You can view your videos from your computer or connect your camera to a computer with the supplied USB cable. The camera will enter into Mass Storage mode, which allows the camera to act as a USB Flash Drive. Does the dashboard camera record when the vehicle is parked? The dashcam will only record when the vehicle is parked when it is plugged into an appropriate power source. If your cigarette lighter ports in your vehicle do not stay live after the vehicle has powered down, then you’ll need to either hardwire the dashcam or use a power bank. Every device has an option to turn off audio recording. You must go through the setting options and set the voice recording option to off. Please refer to your device’s user guide available under support for each model. Do I need to manually turn the dashboard camera on every time I start the vehicle? No, the dashboard camera will automatically turn on and start recording when the cigarette adaptor plug receives power. Do I need any special software to play the recorded video? If your current media player cannot play the recorded video, please download our download the latest version of quick time or download PAPAGO GoLife Software from our web site. P2 Pro-> Support-> Find GoLife Software download. Where is the GPS logging information saved? The GPS Logging information is saved in the memory card. Is the GPS Logging system live tracking? The GPS Logging system is not live tracking system. Currently it does not have the functionality to track a device. Can I connect an external hard drive to the dashboard camera? Unfortunately at this time, all PAPAGO! dashcams are designed to save video recordings onto a memory card only. How do I “save” a file when I am driving? The recorded files are automatically saved into the SD or micoSD card, depending on the model. When the memory card becomes full, the camera’s loop recording function will automatically loop/recycle the oldest video recording, and creates a new one from available space. If you want to ensure that a particular file does not get erased simply back it up. Please refer to your device’s user guide available under support for each model. How to make Dashcam suction cup mounts stick? Start with a clean dry surface. If the temperature of the suction cup is drastically different than that of the windshield it might cause the suction cup to lose its’ grip. If you need to, a little moisture might help it to seal firmly. Find your target on the windshield, press it on, and apply firm pressure to the center of the mount. What you are doing, and want to do, is to push all of the trapped air between the mount and the windshield out from behind the mount. Try not to let the mount slide (if it slides easily you might have used too much moisture) and keep firm pressure for about fifteen seconds. Are thieves more likely to break into my car to steal the dashcam? We advise, just like you would with any valuable items, that you take your dashcam down when your vehicle is left unattended. It is helpful if you carry a cloth in your car so that you can wipe the ring off from the suction cup. Some thieves may know that such a mark is from a dashcam and may try to break into your car. How can I play the .ts file that I get from the P3 and P2 Pro on my Macintosh Computer? There are different media players you can download for free or at a low cost. VLC is the most widely used free software for MAC or Flip Player is also good to use at a low cost. How can I convert a .ts file so that I can edit with it on my Macintosh Computer? We recommend that you download Handbrake. It preserves the quality of the video 100% and is very user-friendly. Please email us at support_us@papagoinc.com if you have further questions. How do I update the firmware on my dashcam? 1) Check the version on your specific dashcam (Please refer to manual or product page). 2) Download the latest version of the firmware. 3) Unzip the file. 4) Drag and drop the file onto the SD Card. 5) Delete the old version off of the SD card 6) Plug the SD card into the dashcam. It will take a few minutes to automatically update. How do I update the Maps on my P3? 1) Download the latest version here under the Support Tab. 2) Unzip the file. 3) Delete the old Navi folder on P3 SD card and replace with new “Navi” folder 4) Plug the SD card into the dashcam. It will take a few minutes to automatically update. How do I update the Speed Camera on my P3? 1) Download the latest version here under the Support Tab. 2) Drag and drop the folder into “speedcamera” folder on SD Card 3) Delete the old “papago_spc.bin” folder on P3 SD card and replace with new “papago_spc.bin” folder 4) Plug the SD card into the dashcam. It will take a few minutes to automatically update. What do I do if the anti-virus software or browser prompts you with a warning message when downloading GoLife Run sync software for my GoWatch 770? The GoLife Run Sync software may be judged as malicious by your anti-virus software or browser and blocked from downlaoding. Please turn the anti-virus software off and download again. Make sure to turn the anti-virus software back on immediately after the download to protect your computer. Why is my dashcam giving me an error message about my SD or MicroSD card? I purchased a 8GB-32GB card and formatted it? We have found that there are some compatibility issues with some brand name MicroSD cards even after you format the card correctly. Please refrain from using these incompatible brands that cause functionality issues: Sandisk, Samsung EVO, PNY, Verbatim and most off brand cards. We recommend that you use any of the following brand cards: Transcend, ADATA, Kingston, Patriot and Silicon Power (SP). Here are the steps on how to reset the time and date? Step 1) Power on your dashcam using an appropriate power source (5v==1a, or car charger). After it’s powered on you’re going to pushthe “OK” button to make the cam stop recording. Step 2) After the cam has stopped recording push the menu button twice. Then scroll down till you see “Date/Time” selected, then push “OK” button. Step 3) After pushing “OK” it’ll bring up the “Date/Time” settings screen, here you will use the arrow keys “UP” & “Down” to change it to the appropriate year, then push the “Menu” button to change the month instead also using the down/up arrow keys to find the right month, then push “Menu” again to change the day then use the down/up arrow keys to change the number of the day. Step 4) Push “OK” to keep the date/time settings you entered. Then push the “Menu” button to get out of the settings menus. Do I have to register my dashcam in order to use warranty services? There is no registration necessary. We just need you to hang on to your receipt, please. You will be asked for your receipt to use warranty services when contacting our customer service team. How do I change the MPH to KM/H on my dashcam for the GPS/Speed logging? Step 1) Power on your dashcam using an appropriate power source (5v==1a, or car charger). After the dashcam has powered on, please push the down arrow key to bring up the settings menu. Step 2) Push the down arrow key 13 times then push the “OK” button. Step 3) Next you will see “GPS Stamp” highlighted on the screen then push the “OK” button to select this option. Step 4) After you’ve pushed the “OK” button you will see two options “KM” and “Mile”. Push the up arrow key to highlight “KM” then push the “OK” button to make the selection. Where can get a spare part for my dashcam? If you are still within your one year warranty, you can email our customer service team at service@papagousa.com and submit the Part Request with the following information: Name, Model dashcam you own, which part you need and your shipping address then our reps will get to your request shortly. If outside of your warranty dates, the process is the same but the rep will let you know the cost and how to proceed with the transaction to complete the purchase of said part. I keep getting a “Card Full” error, isn’t my dashcam supposed to loop record? If my warranty has expired am I still able to get my dash cam repaired? Unfortunately, we do not complete any repairs at our US location and only supply replacements when warranty RMA services are requested.